The integration of Virtual Reality with design consultancy quite simply takes the customer experience to another level. 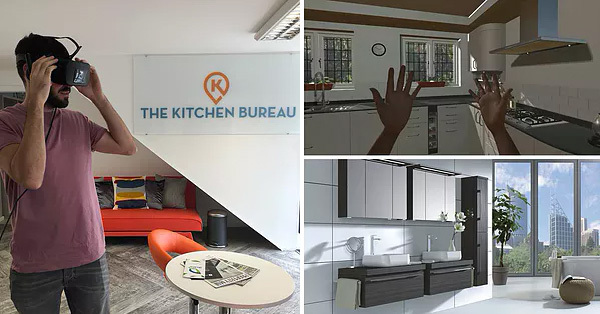 The Virtual Worlds’ 4D CAD technology which we use in our design process delivers high quality, virtual reality and an interactive buying experience via a futuristic headset, whereby our customers can experience a 4D simulation of physically being in their dream kitchen or bathroom design. ​Our customers are able to experience every socket, every stitch, each and every fine detail of their concept and how it may look and feel in real-time. Want to check how much space is between the island unit and the oven? Check. Open drawers to ensure sufficient storage? Open them. Operate functional fittings such as magic corner units? Use them. The 4D experience allows our designers to express their ideas in a precise way that our customers can physically experience.